Home Asus Gadget Tech News Asus Wireless Holiday Promo! 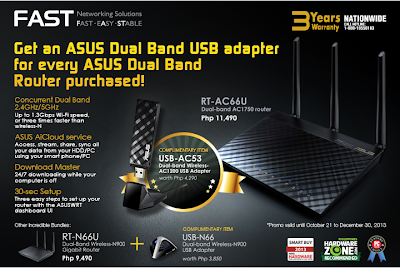 Asus Philippines announced on their Facebook page that they giving a FREE Asus Dual Band USB adapter for every purchased of Asus Dual Band Router. There are two prom bundle they offer. 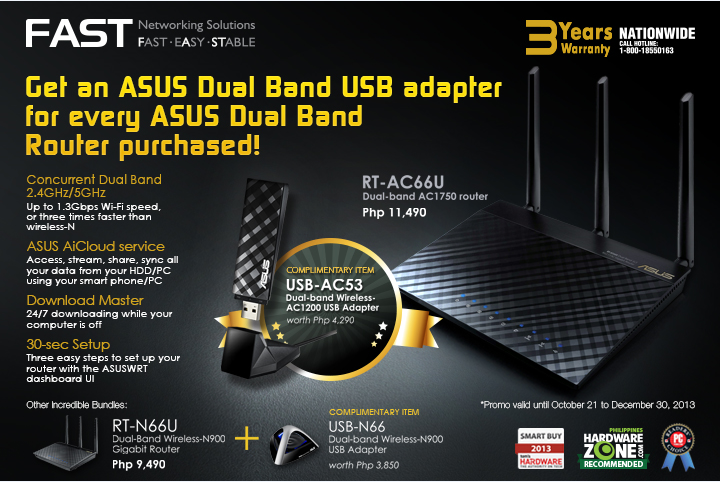 For every purchase of Asus RT-AC66U Dual-band AC1750 router cost Php 11,490 you can get the complimentary item, Asus USB-AC53 a dual-band wireless-N900 USB adapter. The second incredible bundle on the last part of the flyers is the RT-N66U, a dual-band wireless-N900 Gigabit router for Php9,490 plus the FREE complimentary item USB-N66 a dual-band wireless-n900 USB adapter. Promo period runs October 21 until December 30, 2013 only. Related: Galaxy S4 and Galaxy S4 mini ‘Black Edition’ released on February!